Hi pals! Thank you thank you thank you for the nice things you said on Monday. That post probably seemed somewhat random and kind of uncomfortable, but it came from my heart and I’m really glad it spoke to some of you. I know how uplifting it can be to hear about someone else going through the same things you are! 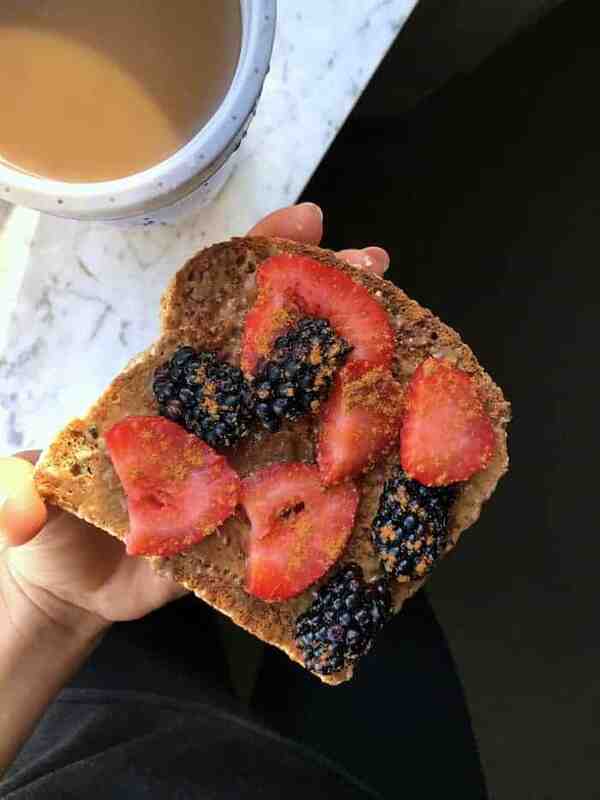 I started the day with a mini breakfast of sprouted sesame Ezekiel toast, almond butter, berries, and cinnamon plus coffee with soy milk before heading to an Alchemy sampling event at The Pilates Studio. I was really hoping to slurp down a post-Pilates smoothie, but I ended up having to run around the city for a couple hours. 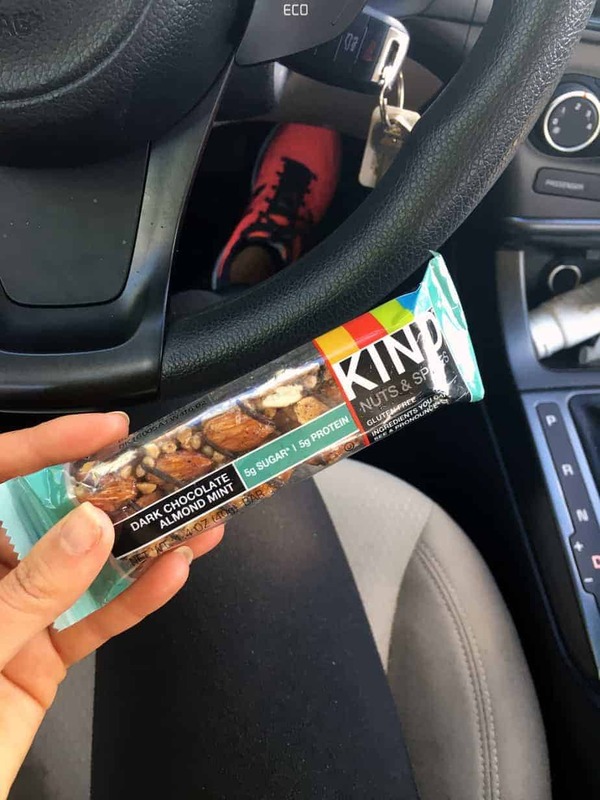 Dark chocolate almond mint KIND bar from the bottom of my bag to the rescue! It was a super crazy day to say the least! That’s the trend as of late. Around 2:30pm I finally had a chance to sit and scarf down a salad I put together the night before of local lettuce, tomatoes, shredded carrot, black beans, leftover roasted tofu, zucchini, and peppers, whisky dill Cleveland Kraut, and red wine vinaigrette. The tofu was from the Fajita Kebabs we had the night before. In case you couldn’t sense my excitement on Snapchat, I assure you they were awesome—totally boyfriend approved Kebabs of all kind are my new thang. 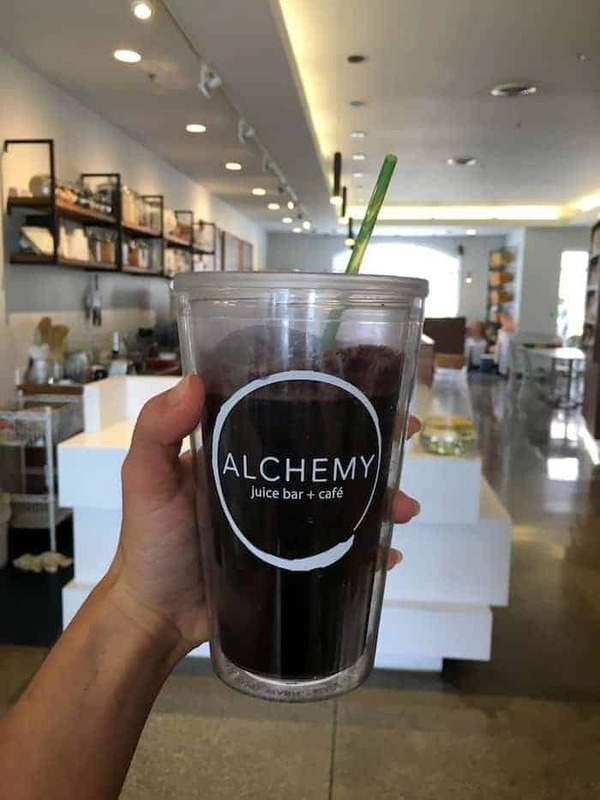 Before a meeting with Fusian, I slurped down a smoothie of frozen blueberries, chocolate brown rice protein, cacao, spinach, kale, and spirulina. Gotta have that nutrition on the go! I got home from work and had a to-do list about 80 things deep. I decided to put the never-ending insanity on hold and just cook. I really, really wanted to cook, which actually surprised me. We had plans to go to Local Cantina for Taco Tuesday but my fridge was overflowing with vegetables that were going to go to waste if I didn’t use them up. I cooked up a serious storm! First I roasted in olive oil, salt, and pepper a combination of eggplant, zucchini, and onion followed by carrots, beets, and sweet potatoes . Lots of the veggies were local from Yellowbird CSA (Alchemy is a pick-up location!!) so they tasted amazing. I think I ate half the pan before any made it on my plate. I mean duh. Then I massaged a bunch of kale with about 1 1/2 tablespoons of apple cider vinegar, 1 tablespoon olive oil, 1 teaspoon maple syrup and dijon, and lots of salt and pepper. I added chopped sun-dried tomatoes, pecans, thinly sliced cucumbers, and a sprinkle of nooch. So savory and delish! 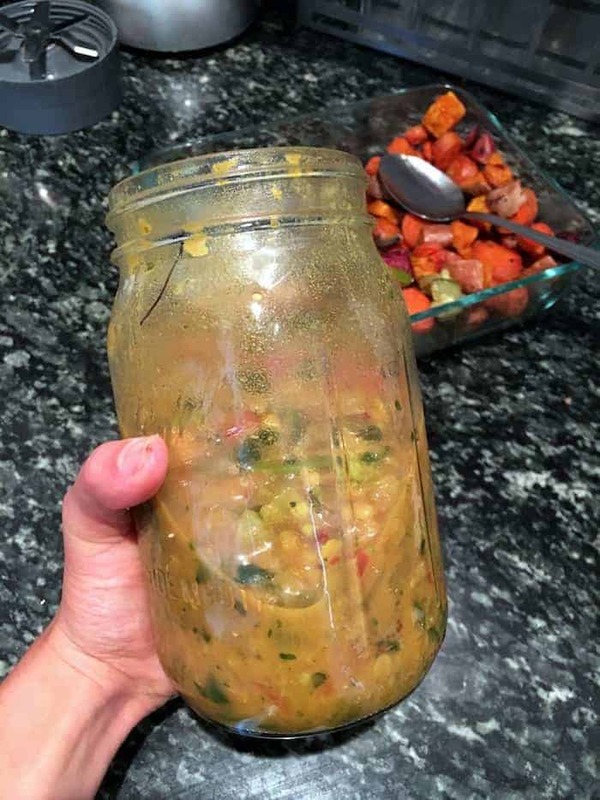 Meanwhile, I started cooking the Glowing Spiced Lentil Soup that I’d been dying to make because I mean…turmeric. You know my obsession runs deep! I picked up some cardamom in the bulk bins at Whole Foods for super cheap and ended up using light coconut milk because they were out of full fat. Rats! Since I had leftover broccoli and lots of fresh ginger, I threw those in while I sautéed the onions. At the end I added frozen spinach that I defrosted in the microwave since I didn’t have fresh. I sampled a bowl’s worth while it cooked, obviously. Perfect for lunches this week! While the soup simmered, I cooked a couple salmon fillets that came today from Door to Door Organics. Lately the boyf has been plenty satisfied with vegan lasagna, enchiladas and the like, but I thought I’d treat him to some nice wild salmon tonight. It was a stellar meal, I must say. For dessert I made this yummu Chocolate Chip Banana Bread. It’s definitely less sweet than your typical loaf, which we liked. The only big change I made was using peanut butter instead of sun butter. We paired it with my new organic coconut milk ice cream obsession, Nada Moo. So far I’ve tried the chocolate cherry, pistachio, salted caramel, and snickerdoodle. I think the chocolate and snickerdoodle have my heart. Run to Whole Foods and get some of this vegan greatness stat! Rest assured that I don’t normally come home from work and whip up this Betty Crocker-like spread. I hadn’t prepped food in a loooooong time before this. Last night’s dinner was a frozen Amy’s burrito, chips and salsa, and two Flourless Peanut Butter Zucchini Brownies. Nothing green at all. Balance, right?! Stay rad. Love you guys like cah-razy. A full fridge is a huge motivation for me to stay home and cook! I try to not go longer than a week with taking a trip to the grocery store or else I’m thinking of all the place to eat outside my house. 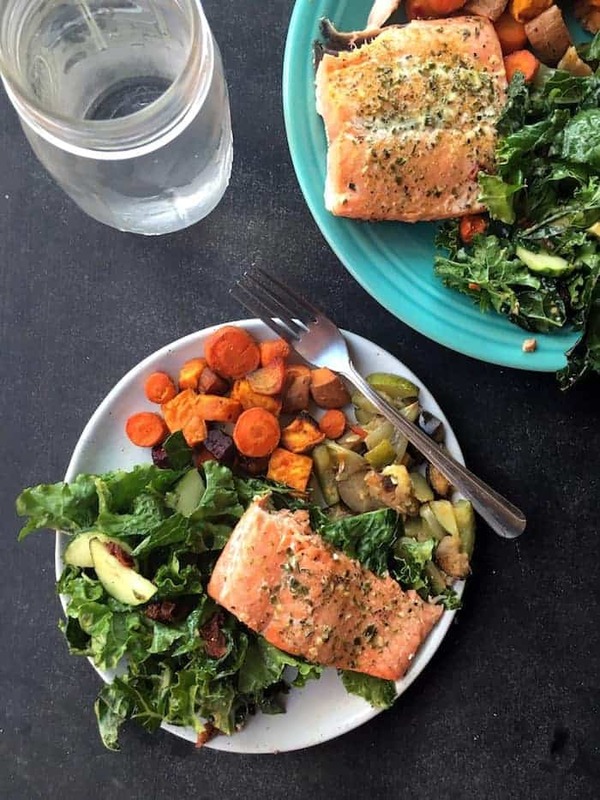 You’re salmon looks restaurant style! So yummy. Whisky dill kraut?! Send some to Florida, pretty puh-leaseee?! 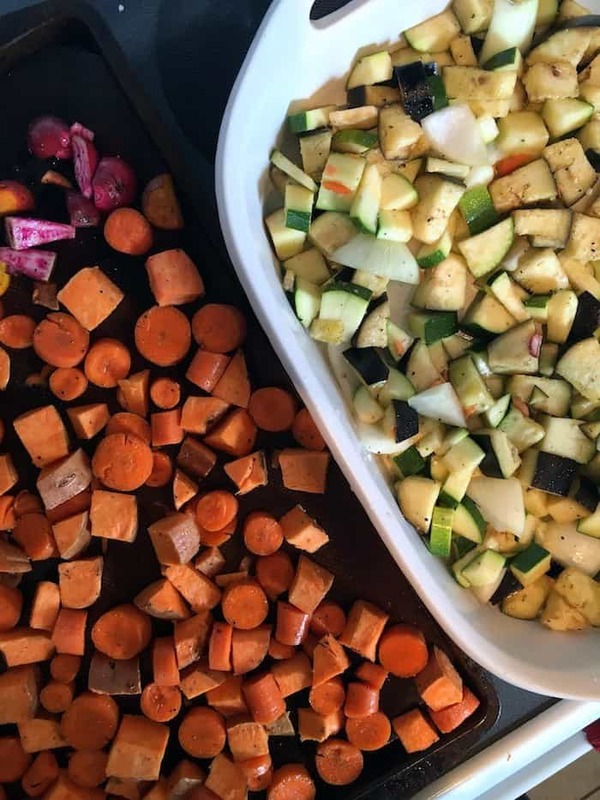 I mean who doesn’t eat half the pan of roasted veggies? It is just expected from me now. And agree with Victoria, that kraut sounds bomb! You may have changed my life with coconut ice cream. I’m lactose intolerant and haven’t had any in years. I just never thought to look for it. Now I’m on a mission! 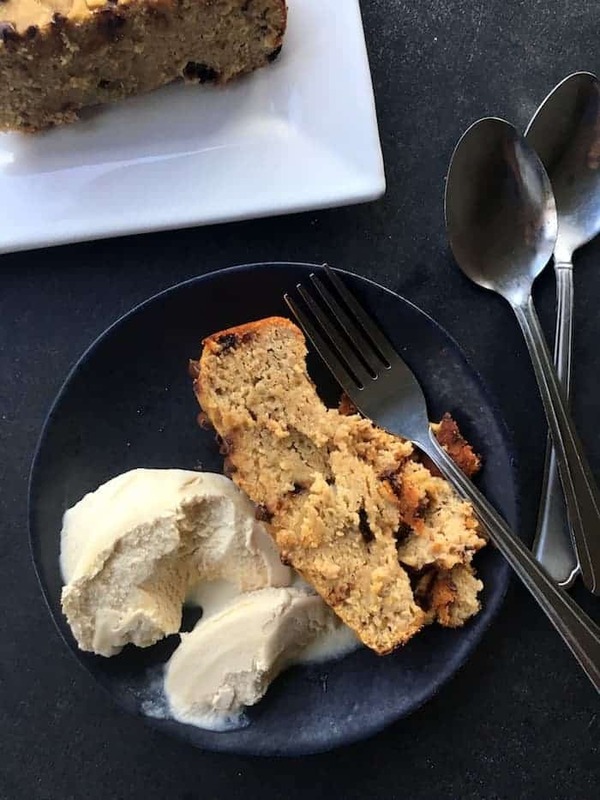 Putting that banana bread on my list of recipes to make ASAP! Looks like a delicious day of eats. So jealous of those roasted veggies! 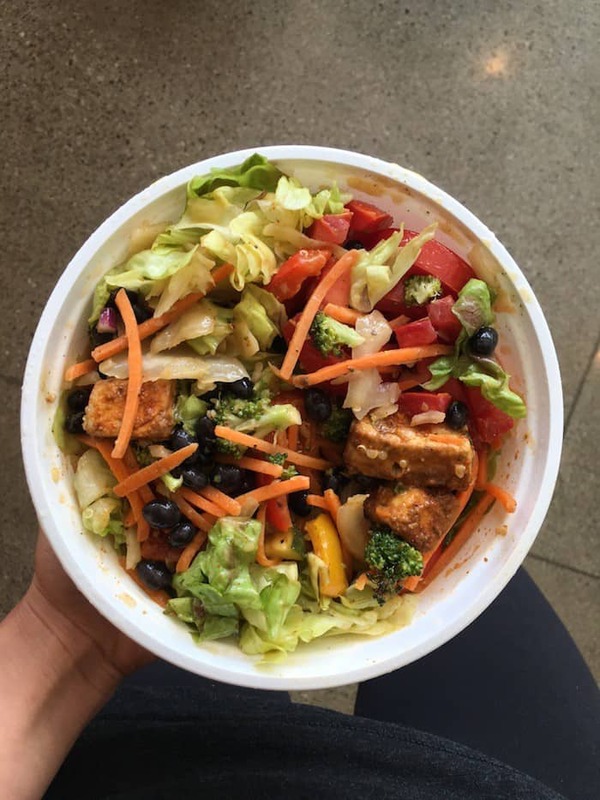 I’m thinking a big hummus and veggie bowl is in store for my lunch today now that you’ve got me craving them. Sweet breads/muffins with ice cream is my ultimate dessert lately! The cakey texture is just so perfectly complimented by the creamy ice cream. I’m all out of breads/muffins and have a bunch of bananas going ripe, so I think I may have to whip up a loaf of that banana bread this weekend. I’m so glad you tried Nada Moo. Seriously life-changing, right? My #1 flavor is the mint chocolate chip. I swear every bite has at least 5 mini chocolate chips in it, it’s amazing.